Tamar has been playing the flute since she was a young child. She came to Israel in 1983 from Ann Arbor, Michigan, and has studied and performed in a wide variety of musical styles. She lives in Jerusalem with her husband, percussionist Yitzhak Attias, and their children. She plays flute, alto flute and a variety of Irish whistles. When did you begin playing the flute, especially Jazz? My more serious studying began in high school where the world of jazz, improvisation and world music opened up to me. Most of my learning experience has really come from actually performing, but I have had some great teachers - Wendy Eisler-Kashy; the CHS Jazz Ensemble under the guidance of Barton Polot and Mike Grace; the WCC Jazz Orchestra under the guidance of Morris Lawrence, Jr. - both of those in Ann Arbor, MI; as well as Steve Horenstein and Idit Shemer in Jerusalem. I began performing with my brother when I was 12. We entered the Pizmon Tichon, a Jerusalem based song-writing contest featuring high school students' original compositions and we were one of three winners. You've recorded and performed with quite a number of artists, haven't you? I've played for Rav Shlomo Carlebach, Ashira, Shoshana Harrari, Yehuda Glantz, Yehudah Katz, Josh Lauffer, Chana Yael, Sunita Stanislaw, and on my husband's CDs, of course. About sixteen years ago, I joined Tofa'ah. The first time I had seen them perform, I remember thinking, "This is so cool, Jewish, and they're good!" We'd all been performing for years and they were looking for a new flute player, so the time was right. What do you seek to do, or put into the world, through your music? Music is completely integral to my relationship with Hashem and always has been. When I'm playing the flute, I try to connect to myself and to others, to hopefully be able to express and experience the depth and beauty in G-d's world. Music can be very healing; I would like to be part of that process. There was one particular Tofaah concert ... we were playing for inmates at a women's prison. People were dancing, crying, sharing. One woman grabbed the mic and cried about how her soul hadn't been touched this way for years. We were all tearing with emotion. The prison guard turned to me and said, "If you knew what she did, you wouldn't be crying. She killed her brother and her father." But look at the power of music - at least for that one moment! You know, I also remember how, before we entered the building, Yona handed each of us a "Get Out of Jail Free" card! Yona, and playing the flute for Tofaah, have taught me about loyalty, about truly pursuing and sharing what one finds meaningful and valuable, no matter what the circumstances. 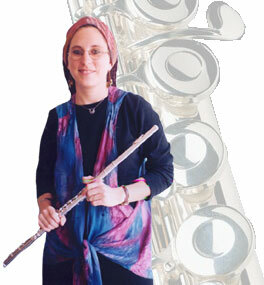 Tamar teaches flute to women and girls in Jerusalem. She combines standard note reading with ear training and improvisation. If you're interested in learning how to play the flute with Tamar, please fill in the form below to contact her.